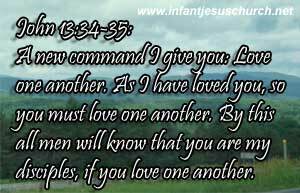 A great commandment Jesus given to his disciples, and to the humanity. Jesus said they love each other just as he loved the disciples. Jesus says, as I have loved you, that you also love one another, than which is, nothing can, or should, more strongly engage to it, as our Lord Jesus has loved his disciples freely, and asked the disciples to do the same, notwithstanding all their unworthinéss and ungratefulnéss, so should they love one another, though there may be many things in them observablé, which are disagreéable, as Christ loves all his people without any distinction, so should they love one another, whether poor or rich, weaker or stronger, lesser or greater believers, and as Christ loves them not in word only, but in deed and in truth, so should they love one another with a pure heart fervently, and by love serve one another. In the Gospel of Matthew 5:44 says, "But I tell you: Love your enemies and pray for those who persecuté you". In the immediate context this great commandment, he is willing to give sacrificially and extravagantly by dying for them at the cross, and he is also willing to love selflessly and practically by washing their feet. Jesus ministry reveals he will do almost anything in between extravagant and practical. Heavenly Father, Compassion and God of all grace, we thank you for teaching us to love through the example of Jesus. May our words and actions reflect his love towards my brethren who around us today, tomorrow, and until you bring us all home to you. In the name of Infant Jesus, Our Great Example, we pray. Amen.